I asked LynDee, now a Top Selling author (upgraded from first-time author, y’all! ), to rejoin us and talk about what it is like to have seen such major success in her freshman offering, Front Page Fatality. I am so excited for her, and I hope you’ve already bought your copy because it is truly a great read. LynDee’s first novel–it’s a top seller! See below for buying links. As I sit here wondering where the heck February and the first part of March went, I’m must say I’m reeling a bit, and ever so grateful for everything 2013 has brought. Even if it has been kind of a blur. My eyes popped open early on January 29. Like a kid of her way to Disney World, I jolted myself out of sleep singsonging “it’s here, it’s here, the day has come!” in my head. For more years than I care to admit, I’ve daydreamed and real-dreamed about what my “book birthday” would be like. I’ve also studied and learned enough about the way book launches for debut authors with limited publicity budgets go, to have prepped myself to enjoy the day by having pretty modest expectations. As in, I’d been telling myself for weeks that if five people who’d never heard of me bought my book and liked it, I’d be very happy. Little did I know, y’all. Oh, just how little. My fantastic husband planned a lovely day for me: I signed preorders at the bookstore that hosted my launch party, we stopped downtown for lunch, and we even had date night. By halfway through dinner, my book was number 41 on amazon.com’s hot new releases list in mysteries with women sleuths. At that time, I didn’t even know it was charting in humorous fiction. By Friday night, it had climbed to number one in new humor, number two (behind James Patterson) in new women sleuths, and number five in humor overall. Can we say “head spinny?” I spent that whole weekend looking around for Rod Serling. Heck, it’s been seven weeks and I’m still looking! I haven’t seen him yet, though. I did interviews on various blogs, one with my local ABC affiliate (I was so nervous. Lucky for me, the anchor was very nice and you can’t really tell I was nervous. Much. ), and another last week with a newsmagazine. One book blog chose my book as their favorite of February, and another named it in the top 5 books of the week just this week. And I’ve gotten fan mail! Like, actual people I’ve never met have taken time out of their lives not only to read my novel, but to write me notes, telling me how much they enjoyed it. How awesome is that? It’s been amazing. Like walking around in a dream, truly. Maybe a little overwhelming at times, but I’m just so honored and flabbergasted that people are saying such lovely things, it’s largely been one of the best months of my life. 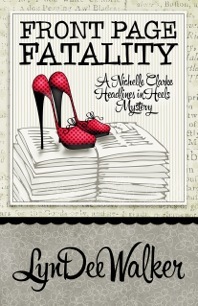 All the while, I was trying to finish up my second Nichelle Clarke Headlines in Heels mystery, Buried Leads, and get it ready to send off to my editor. I loved getting to go back to Nichelle’s world and see how life is treating her, what has changed for her, and what kind of trouble she’s getting into now. Writing the sequel was like getting to know an old friend better, and I’m so, so glad I get to write more books about Nichelle and her friends, because I adore her and am still not ready to say goodbye to her. Getting Buried Leads ready to turn in was an entirely new experience for me, though. I’d never written fiction with a deadline, and I’d also never have dreamed of sending a manuscript to an editor after one pass through my betas, two reads after the rough draft. But I did. Then I started immediately on Nichelle’s Christmas adventure, a novella slated for publication this December. Last week, I got my edit letter on Buried Leads. As usual, my editor is brilliant, and saw something I could change that will make it a much better book. It’s also a major revision, though, and I panicked a little, because I have other works under contract with deadlines. Fortunately for me, this revision has fallen into place such that I’m scratching my head wondering why on Earth I didn’t think of this in the first place. Truth be told, I love revising. I love digging into a book and strengthening the plot, tightening the writing, and punching up the dialogue. I love getting to spend more time with my imaginary friends. And though I admit to an initial freak-out, I love having an editor who can point to the precise thing that needs changing, say “fix this,” and send me down a merry path of new ideas that make all those things happen. I am not good at working on two projects at once, so Christmas has been put on hold while I spiff Buried Leads up, but I’ll get back to it, hopefully with more knowledge of how to make it better and stronger. Writing is still my first love, and I can’t wait to see how Nichelle’s holiday ends up. I have dreamed of being an author for so long, and living it these past seven weeks has been wonderful. Thank you so, so much, to everyone who has bought, read, and said lovely things about my novel. Y’all have made this an experience I will never forget, and you have no idea how much I appreciate every one of you. Thanks so much for having me, Lane!